Very good information here. The bottom line seems to be that the human race is growing rapidly, and the other species aren't. So we try to make up for this shortfall by farming otherwise wild species of seafood, including salmon. In the long run, could this be a big mistake and harm the wild species? It seems that the answer, for now, is yes. Many states in the US have erected dams, which means the large rivers have slowed to a trickle. And without the rivers, there won't be salmon. I'm no expert, but I think we need to conserve water so that we don't use so much. Then these dams could be opened to fill the river beds once more. And we need to eat a plant-based diet. I am not talking about being a vegetarian or vegan, but it seems to me most people in the US eat more protein than they need. (And more processed foods, but I'm not saying any more about THAT). This was a ground-breaking week with NBC News, CTV, Vancouver Sun and Globe and Mail reporting on problems with Norwegian industrial salmon farming and very disheartening news from DFO that we should not expect healthy wild salmon returns this year. There was a significant legal decision and I received a graph which seems to portray the lice levels in the Grieg Seafood fish farm that we filmed in Nootka. Next week the Federal Standing Committee on Fisheries and Oceans is formed. If we don't get impact of salmon farming on their agenda the Norwegian fish farm industry will be successful again in degrading the Canadian Fisheries Act, to protect Norwegian interests at expense of threatening our salmon. So stay in close touch with your MP about this. They are hearing from a very well-run Norwegian lobby. We don’t have those kinds of funds, but we are much more numerous. And if you have doubts about contacting your MP there is new research showing that the politically active are the happiest people! Some really good news just received! Hello All 17,000 of you salmon people on this list!! The Columbia River is now receiving near record daily numbers of sockeye salmon passing Bonneville Dam in Washington State! Their Technical Advisory Committee has upgraded the run as they are now expecting a return that will break the previous record set in 1955. Also people are cheering to see large numbers of sockeye returning to Spout Lake on western Vancouver Island. The fish are large and beautiful. These two early returns suggest the North Pacific was full of good food for sockeye. These two runs were unaffected by last year's crash. The indicators for the Fraser River are good. Some portion of sockeye return a year earlier than the rest of their generation and they are called "jacks." The number of jacks was extremely high last year. This suggests that this generation of Fraser sockeye made it out to sea in good shape and had a good first year at sea. In the past the number of jacks was an excellent predictor of the size of the next year's run, but the scientists who follow sockeye have found they are not as reliable as they use to be. The Fraser River sockeye stocks are like a rope. They are many different runs that spawn in many different areas of the river and these runs are made of many generations. The generations are not all equal. There are dominant cycles and off-cycles. This is pulse of salmon life. All these individual strands of runs and cycles twine together like a strong, living rope. The strands are separate, but they twist together as they run to sea and back. Fraser sockeye scientists are not able to predict returns anymore. While predictions remain true in Alaskan waters, something has changed in BC waters that no one has measured and factored into the models. There is a new and unknown variable having strong effect. There is a good chance BC will be blessed with an abundant sockeye return to the Fraser River system. If we are lucky enough (and luck is now involved as mangers are running blind) please don't let the media tell you we don't need the Cohen Inquiry or any of the other investigations into the decline of the Fraser sockeye. 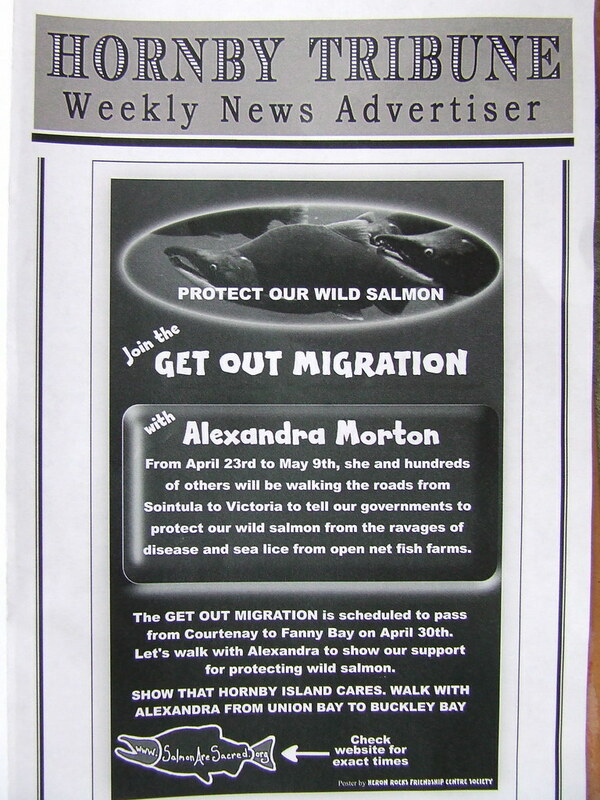 I say this because this is what happened last year with the pink salmon returns. We were asked to believe that because we got one good run back, we could all abandon concerns and vigilance. The return this year is no indication the other years and runs have or will recover. In fact for reasons no one can explain yet, this strong Fraser cycle has been less impacted than all the others over the past ten years. If we get this run back we can know there is hope and all the more reason to do everything we can to make sure BC and the world do not lose this generous fish. I love this time of year, when hope rules and we wait to receive the power of the natural world to feed us, and our world. We are increasingly lucky to live in this part of the world where hope is still possible. Also thank you for all your orders at alexandramorton.ca you are keeping me viable! Oh Blue this is such great news! Thank you for sharing with us. I've read several articles about fish hatcheries and also about farmed fish. A number of studies have criticized both. I avoid farmed fish but haven't reached a conclusion about the hatcheries. So much depends on how they are operated, the diversity of the species, etc. The first salmon runs are returning to the rivers in August. Other species of salmon run and spawn later in the fall. 2010 is a record year for sockeye salmon! The return of this year's Fraser sockeye is a phenomena. The fishermen have not seen it this good for 50 years. They keep thinking the last sockeye has entered Johnstone Strait, but the fish just keep pouring in from the Pacific at both ends of Vancouver Island. Scientists could not forecast this enormous run because they don’t know what caused last year’s collapse. They were protecting fishermen from over-spending on new gear, but now the processors are unprepared. Thank you for sharing that with us, Blue It will be good for the eagles and bears! Happy, happy!!! Will be see salmon-gorged eagles when they return? You betcha! A couple of the pictures my daughter took, of these Sockeye salmon, it was amazing sight. Oh my, passerine, that is amazing to see. I have never seen salmon (maybe on tv?) like that. Beautiful photos. Thanks for your daughter's photos, passerine. What beautiful colours! Beautiful pictures! It's almost as good (not quite) as being there. Wonderful photos of the salmon!!!! Thanks so much for posting them! Thanksgiving Dinner for Eagles and other critters!!!! Hurrah!